King Of Ragtime | Spirit of Scott Joplin — The king of ragtime writers. For Ragtime lovers everywhere! 1 April 2017 marks 100 years to the day of Scott Joplin’s passing. Americans across the country honored the occasion in a tribute to the great composer of the “Maple Leaf Rag” whose wish to have this piece played at his funeral was not honored 100 years ago. Richard Dowling performed all-Joplin concerts nationwide throughout 2017 & 2018 highlighted by the first public performance in history of The Complete Piano Works of Scott Joplin in Carnegie Hall on April 1, 2017, exactly 100 years to the day that Joplin died in New York. Not many composers are publicly celebrated in such a high-profile fashion by professional musicians a century after their passing as Scott Joplin was. It speaks to the love and respect for the musical genre he catapulted to worldwide acclaim at the turn of the 20th century — Ragtime. Time to jam the “Maple Leaf Rag” in tribute to Scott Joplin who wanted it played at his funeral on this day in 1917, though it never was, as explained in our 2012 post when we started this Maple Leaf Rag Day tradition. In “Three Pianos on Fire,” Tom Brier is joined by Patrick Aranda and Frederick Hodges at the Sutter Creek Ragtime festival in 2009, where they all join together to play the Maple Leaf Rag at a blazing speed (as many players do, despite the composer’s wishes to not play ragtime too fast…). For longer version of her Scott Joplin medley that includes additional numbers, see this video of Mimi’s performance from 2008. So cheers to Scott Joplin, King of Ragtime composers, and a hearty Maple Leaf Rag Day cheer to all who appreciate his enduring musical contribution! The tradition continues this year as we honor Scott Joplin’s unfulfilled wish to have the “Maple Leaf Rag” played at his funeral. Read this post from 2012 which explains the story behind this blog. Play it if you can, listen to others playing if you can’t! In last year’s post, all of the featured performances of the MLR were done by men. So this year we’re putting the women in the spotlight. Continuing the tradition from last year when we began marking the anniversary of Scott Joplin’s funeral on 1 April 1917 with a playing of Scott Joplin’s Maple Leaf Rag, everyone is invited to play this piece on their instrument of choice, or just listen to it, this April 1st. So let’s do our best to honor the Maple Leaf Rag on April 1st. If you play it already, perform it as if you were personally asked by Scott Joplin to perform it at his funeral. And if you can’t play it, try learning it on whatever instrument you prefer (humming, whistling, spoons & cheeks are fine, too :)). If you’re not a musician, give it a listen on this day. One of the things that Ragtime sparked was improvisation, as different performers would take a piece like the MLR and personalize it with their own embellishments. Eubie Blake, Jelly Roll Morton and many other pianists of the ragtime and early jazz era enjoyed riffing on the MLR and other of Joplin’s pieces. Did you play it or otherwise enjoy the MLR on April 1st? Do you know of different versions played on different instruments? Leave us a note in the comments. If you’ve got a video of yourself performing it or another favorite version of it, include a link in your comments. Scott Joplin died on 1 April 1917 and his request to have the Maple Leaf Rag played at his funeral was not honored. So time has come to make amends and honor Scott’s request in a manner appropriate to the internet age. Here’s the plan: on April 1, play the Maple Leaf Rag on your instrument(s) of choice. Band performances are fine, too. If you don’t play any instrument, fire up your favorite Maple Leaf Rag mp3. Crank it. Musicians: You are strongly encouraged to share your performance with the world, so record yourself (or a friend or your band), upload your recording to your favorite video or audio sharing website, and post a link to it in the comments below. You can also tweet it to @King_Of_Ragtime or share it on the King Of Ragtime’s Facebook wall. Or keep your performance private, if you prefer, but feel free to share your thoughts. Videos posted on YouTube will be collected on the KingOfRagtime’s channel. Start practicing your Maple Leaf, get it down and be ready to jam on 1 April. Play it straight as-written, or add your own interpretation. It’s a challenging piece, so don’t worry about playing it perfectly — this isn’t a contest; energy and spirit are much more important than perfection (but don’t play it too fast ;)). Remember, it’s important to perform the piece live on 1 April. Play as if Scott Joplin had personally invited you to perform it at his funeral. Let’s all give him the funeral he wanted! 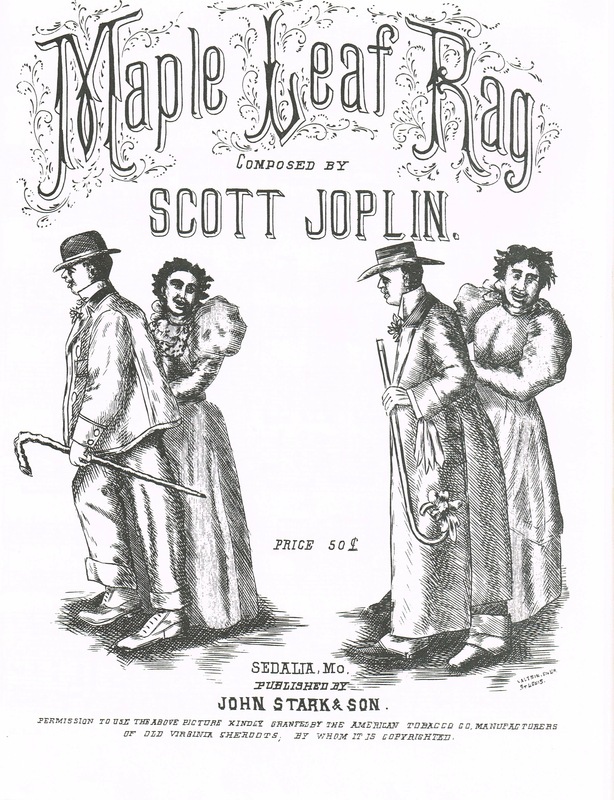 April 1, 2012 will mark the 95th anniversary of Scott Joplin’s passing and this will be the first year of his belated funeral Maple Leaf Rag performance. If there’s interest, maybe we’ll do something special for the 100th year anniversary in 2017. Welcome to KingOfRagti me.com — a new fansite dedicated to the spirit of Scott Joplin, king of Ragtime writers. Learn more on the about page.